Grand Theft Auto V--too good for the PC, by Rockstar's reckoning--thinks it has a monopoly on driving really fast while fleeing for your life. Well, their 800 million dollar (!) magnum opus might be the bee's knees, but indie-darling Race the Sun is an utterly fantastic take on the endless runner that'll only set you back $10. And it's available on PC, Mac, and Linux; take that, smug console gamers. 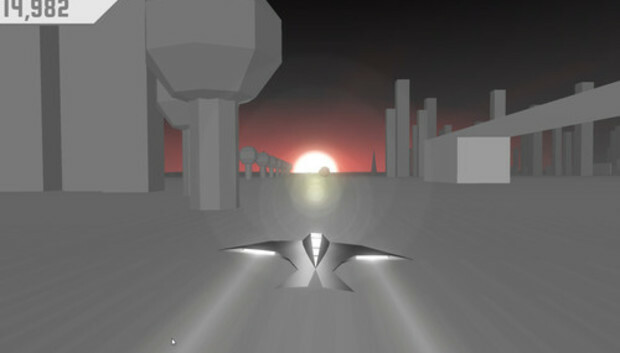 You are a solar-powered aircraft racing down a strip of infinite landscape, soaking up sunlight, dodging shadows and the massive objects that make them in an attempt to earn as many points as possible before sundown. There's a stark, unnerving sense of urgency as the sun drops in the distance, one completely at odds with the light, floaty feel of the funky craft as you bank around collapsing pillars, take sweet jumps off of ramps, generally soak in the beautiful minimalism of it all. An asynchronous cooperative mode lets you participate in a relay race with buddies, and a level editor lets you create chunks of world you can upload online, and encounter randomly on your own treks. Best of all, the procedurally generated world is a little different every day, with new leaderboards generated every 24 hours to keep the experience (and competition) fresh. Let's see your gorgeously-rendered satirical facsimiles of major metropolitan areas try any of that. Gory gunplay with scads of AI-controlled police officers or online competitors is so blasé. These days I need a shooter that leaves me questioning the very nature of existence, re-examining my understanding of temporality, pacing, and the superfluousness of rich color palettes. Super Hot is that game. Born during last month's 7DFPS game jam, it's a shooter in which time only moves when you do. It's a simple, subtle sort of brilliance, as every level evolves into a sort of first-person puzzle: walking around or simply adjusting your crosshair will cause time--and those bullets the bad guys are firing--to flow freely. Limited ammunition requires you to relieve foes of their weapons whenever possible, stepping gingerly about the gorgeously minimalistic levels to get into close combat range without taking bullets to the face. Who needs console-only carjacking and assault rifles and helicopters when the very rules of physics are your plaything? What's that you say? The Grand Theft Auto series has always bolstered ultra-violence and madcap antics with a strong, nuanced narrative, rife with satire and criticism of our disjointed society? A rich fiction years in the making, that you'd be hard pressed to reproduce without such a strong, sweeping medium as the open-world game? Boom. JAWS: The Text Adventure. It's got everything--combat, exploration, and existential angst all rolled up into one gorgeous-ish package. Encounter a rich, varied cast of characters, and eat them. Explore West, East, or even Down and Up. Participate in a narrative tour de force that's at least a decent complement to the fascinating novel and pretty good movie. There's even a bit of gore, if you're into that. All that, free of charge--Rockstar can keep their adolescent power fantasies on their little living room boxes; us PC gamers have plenty have everything we need right here. What? No, I'm not bitter.